As chronicled in Christopher McDougall’s bestselling book, Born To Run, LUNA’s founder Barefoot Ted traveled to the Copper Canyons of Mexico in 2006 to run a 50-mile ultra marathon. There, Barefoot Ted was befriended by Manuel Luna, a legendary Tarahumara runner. 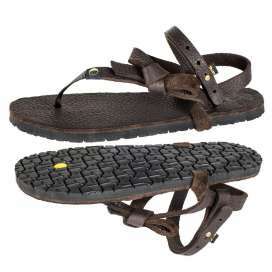 Manuel made him his first pair of traditional tire “huarache” sandals. 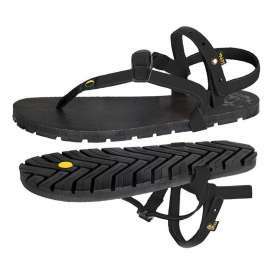 The spark for LUNA Sandals was born. 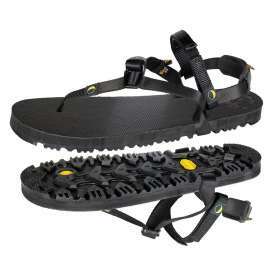 Drop 0/Weight 167g/Stack Height 15 mm The Mono 2.0 is our do everything, go everywhere adventure sandal. Whether you’re hiking, traveling, lounging, camping, running, spelunking, or anything else-ing, this is your go-to footwear.Vegans. Drop 0/Weight 206g/Stack Height 15 mm Luna Mono Chocolate, also known as "Chocolate Monkey" is the most luxurious sandal of Luna Sandals. Made with soft, supple premium American buffalo leather and hand-cut buffalo laces, the Mono Chocolate combines tradition, style and comfort. Drop 0/Weight 240g/Stack Height 13 mm True to Luna's roots, the Origen 2.0 uses an upcycled tire tread as the outsole and a Vibram midsole, creating an earth friendly, ultra-durable, and ruggedly comfortable platform to launch you out into the world, ready for nearly any urban or trail adventure. 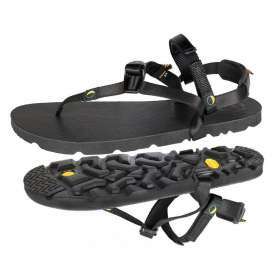 Drop 0/Weight 235g/Stack Height 10 mm Rooted in the Mexican leather-topped, tire-treaded tradition of huarache sandals, The LUNA Origen Flaco, "Skinny Origen", is a thin-yet-rugged sandal for those who want the perfect blend of tradition, style, quality and robustness. Drop 0/Weight 204g/Stack Height 11,5 mm Take the Oso 2.0 and shave it down to its “bear” essentials and you have the Oso Flaco (“Skinny Bear” in Spanish). This sandal is for those who want the most aggressive tread pattern for crazy grip, but also want super flexibility and full ground feel. Vegans.